Iris lutescens growing geophyte of the genus Iris also known as Crimean iris, Iris lutescens perennial evergreen plant used as ornamental plant, can grow in mediterranean, subtropics or temperate climate and growing in hardiness zone 4-10a. Leaves green shape is narrow sword-shape, leaves grow in groups linked together. Flowers color purple or yellow, the flower has 6 petals in the outer circle. Home Comforts Acrylic Face Mounted Prints Yellow Iris Iris of The Garrigues Iris Lutescens Print 14 x 11. Worry Free Wall Installation - Shadow Mount is Included. 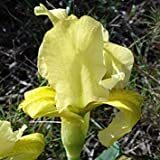 What is the size of a Iris lutescens plant?